James McEwan is expected to have surgery at 2 o'clock Pacific time in Vancouver this afternoon after a tendon was cut in a fight last night with Giants forward Garet Hunt. On video it shows McEwan going down on one knee and getting sliced by the skate of Hunt before getting back up and continuing to throw punches. While it's unknown of McEwan's season is over, its clearly going to be a long road to recovery for a player who is the heart and soul of this hockey club. James McEwan’s season may be over. The 20 year-old captain of the Kelowna Rockets is undergoing surgery in Vancouver this morning after suffering a sever cut to his forearm in last night’s game against the Vancouver Giants. McEwan’s arm was cut during a 1st period fight with Giants enforcer Garet Hunt. It’s uncertain if McEwan was cut by the skate blade of Hunt or the linesman as the two fell to the ice. McEwan originally went to the penalty box after the tilt was over, and then noticed the severity of the cut, and was rushed to the hospital. Only surgery today will determine if any tendons were cut in the unfortunate accident. The injury came while McEwan was celebrating his 200th WHL game. It was nothing unusual to see McEwan and Hunt fighting in last night’s game. It was the 6th time the two have squared off in just two short seasons. While we are on the subject of fighting, I have to give props to 19 year-old Rockets defenseman Colin Joe. Joe stood up for teammate Myles MacRae, who was hit heavily into the boards by Garet Hunt in the 3rd period. Joe was overmatched going into the fight with Hunt, and took a huge right hand to the head that knocked Joe to the ice. While the fight was lopsided, Joe deserves credit for even thinking of dropping the gloves with a skilled fighter like Hunt. Some question Joe’s smarts in getting into hand-to-hand combat with Hunt, but I call Joe’s attempt to defend a teammate as nothing short of courageous. Cody Almond was the best Rocket in last night’s game. While Almond scored both of the Rockets goals, the 18 year-old was involved in the play, was strong defensively, and got into a nice fight with Giants forward Lance Bowma. When Almond competes hard, he’s an impact player. On this night he was worthy of 3rd star status. The Giants power play feasted on the Rockets poor penalty killing unit. Four of the Giants five goals were scored on the power play. The power play goal that took the Rockets out of the game came when the Rockets had scored to make it a 3-2 game. Rockets forward Matt Brusciano would take a late 2nd period penalty, and the Giants would score with the man advantage, taking a 4-2 lead into the second intermission. Without Luke Schenn and Tyson Barrie to quarterback the power play, Rockets head coach Ryan Huska elected to use Cody Almond and Kyle St. Denis on the point. The five forward’s on the power play was a different look, and the puck movement was impressive. Two Giants really impressed me last night. Newcomer Garry Nunn showed some good speed, energy and skill. Nunn left the BCHL’s Victoria Grizzlies for the WHL this season, and the move has paid off for the former line-mate of Rockets forward Jamie Benn. Nunn is a little guy out there, but in today’s WHL game, even the small-skilled players can excel at this level. Nunn is a good example of that. Who is Craig Shira? The Rockets know full well after Shira scored two power play goals in last night’s win. Shira was acquired by the Giants from Regina this season, and logged a ton of ice time as the Giants played without Jon Blum, who is playing for the U.S at the World Juniors. Schira was worthy of the number one star. While last night’s game saw the Rockets on the losing end of a 5-2 game, falling to a team like Vancouver isn’t all bad. It gives the Rockets a wake up call on what it takes to play with the top end teams in the WHL. I am not discrediting the Rockets recent success on a Eastern Conference road trip, but games against Prince Albert and Saskatoon just don’t hold a candle to the type of work ethic, intensity and error free hockey a team must play in order to have success against the top end team’s in the WHL. The Giants are undoubtedly still the team to beat out West. The Rockets elected to stay in Vancouver overnight, and will ring in the New Year here before busing into Chilliwack for Monday night’s game against the Bruins. It's sad that a busy WHL schedule often times doesn’t allow us the opportunity to know the personnel on the opposing team. But with the Rockets spending the night in Vancouver, I didn’t have to rush out of the building to catch a waiting bus. Instead I had a great conversation with Giants Equipment Manager Grant Ferguson. Over the years I have crossed paths with Ferguson, but have never talked to him. 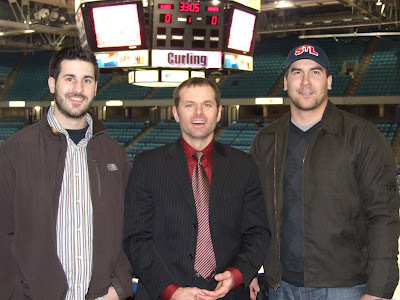 When I broke into the WHL in 1995, Ferguson was with the Lethbridge Hurricanes. He would eventually move on to the Victoria Salmon Kings before returning to the WHL with the Giants organization. My conversation with Ferguson was a lengthy one, and gave me a better appreciation for an individual who I’ve seen for years, but have never taken the time to chat with. Tonight’s Preview: The Rockets and Giants are meeting for the 6th time this season. The Rockets are 3-2-0-0 against the Giants, having won the last three meetings between the two clubs. Overall the Giants have out-scored the Rockets 13-12 in the seasonal series. 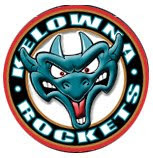 The Rockets are coming off a 3-2 loss to the Kamloops Blazers last night. Jamie Benn scored twice while Colin Long had a goal and two assists in the loss. The Rockets had a 3-2 lead heading into the third period before the Blazers rallied with back-to-back power play goals to earn the win, snapping the Rockets 3 game winning streak. The Rockets enter tonight’s game with points in six of their last eight games (4-2-0-2). Following tonight’s game in Vancouver, and in Chilliwack Monday night, the Rockets open a four game home stand at Prospera Place Wednesday against the Giants. Cream of the Crop: Rockets forward Jamie Benn now leads the WHL in points by a rookie. Benn had two goals in last night’s loss to the Blazers, giving him a one point lead on Brandon Wheat Kings forward Brayden Schenn. Benn’s line-mate Colin Long had a three point effort last night, moving him within three points of Chilliwack’s Mark Santorelli for the WHL points lead. Big Mac: Rockets captain James McEwan plays in his 200th WHL game tonight. McEwan began his career with the Seattle Thunderbirds in the 2004-2005 season. 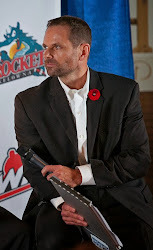 McEwan came to the Rockets for the start of the 2006-2007 season and has played a total of 96 games in a Rockets uniform. Teammate Tyler Myers played in his 100th WHL game last night against the Blazers. A Nice Return: Rockets rookie forward Kyle St. Denis returned to the lineup last night after missing 8 games with a concussion. Prior to St. Denis being injured against the Portland Winter Hawks December 1st, the Trail BC resident had a 6 game point streak (2+5=7). Cody’s Post Christmas Transformation: The Rockets are hoping forward Cody Almond follows a similar path this season as he did in 2006-2007. Last season Almond had just 5 goals in the first half of the season before scoring 10 goals after the Christmas break. Almond started the second half strong, collecting 2 assists in last night’s loss to the Blazers. What a Difference a Year Makes: Colin Long has 28 more points than he had all of last season. Brandon McMillan has 13 more points than he did all of last season. Evan Bloodoff has 6 more points than he had a year ago. Nerves of Steel: The Rockets have played in a league high 24-one goal games this season. The Rockets have played in a one goal game in 8 straight. Big Benn: Rockets forward Jamie Benn was named the WHL Player of the Week for December 10th through to the 16th. Benn picked up seven points in four games. He scored four goals, three assists and was plus four, helping the Rockets to a 3-0-0-1 record in that span. Tyson Time: Defenseman Tyson Barrie has been selected to represent Team Pacific at this year's World U17 Hockey Challenge. This year's squad, comprised of the top 22 U17 aged athletes from Alberta and British Columbia, will compete in London, Ontario at the World U17 Hockey Challenge from December 27 - January 4. This is the unofficial world championship for this age level and the first stage for Hockey Canada to identify players for the National U18 Team and the World Junior Team. Barrie is expected to miss 5 games during his participation at the tournament. Colin Long: Long has points in 12 of his last 13 games (10+15=25). Long has multiple point games in seven of his last 10 games. Long has 14 goals in his last 19 games. Cody Almond: has 1+2=3 in his last two games. Jamie Benn: goals in six of his last 7 games. Overall Benn has 8 goals in his last 7 games. Luke Schenn: 1+4=5 in last five games. Brady Leavold: 4+5=9 in last 9 games. Lucas Bloodoff: No goal last 12. • A few rarities from last night’s loss to the Blazers. The Rockets lost for just the second time this season when leading after 40 minutes. The Rockets also lost for just the second time this season after out-shooting the opposition. • The Rockets have 20 wins this season, just two shy of the 22 they recorded all of last season. The Rockets have 11 road wins, 5 more than all of last season. The Rockets have scored 65 goals on the road this season, the same number of road goals they scored all of last season. • The Kelowna Rockets franchise is closing in on 600 wins as a franchise. The Rockets have 597 wins heading into tonight’s game. The Rockets are in their 17th season of operation, after breaking into the league as an expansion franchise in 1991 as the Tacoma Rockets. Most Power Play Chances: 9 @ PG Nov 10/07 (6-1 W – 4/9) vs. Warriors Oct 27/07. 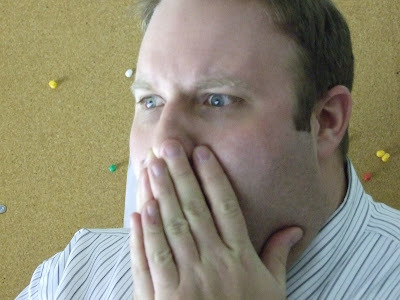 Rockets were 0/9 losing 4-3 in shootout. Penalty Shots: Torrie Jung stops Hawks forward Luke Walker Nov 17/07 in a 4-1 win in Portland. Kristofer Westblom stops Everett’s Shane Harper in a 3-2 overtime loss Nov 16/07 in Everett. Torrie Jung stopped Michal Repik in the 3rd period of a 5-0 loss Sept 29/07. Overtime Winning Goal: Jamie Benn scored at 4:59 December 15/07 in a 3-2 win in Saskatoon. Tyler Myers scored at 3:58 of overtime December 5/07 in a 4-3 win over Medicine Hat. Colin Long scored at :44 of overtime Nov 23/07 in a 7-6 win over Kootenay. Jamie Benn scored at 1:07 of overtime Nov 2/07 in a 3-2 win over Chilliwack. Shootout Game Winning Goals: Dylan Hood scores in a 4-3 win in Seattle October 6/07. Colin Long scored the game winner in a 2-1 win over Vancouver October 24th. NHL Draft Picks-Training Camp Attendees: Jamie Benn (Dallas 07), Torrie Jung (Tampa Bay 07), Cody Almond (Minnesota 07), Milan Kytnar (Oilers 07), Tysen Dowzak (Tryout Philadelphia). Tonight’s Preview: The Rockets and Blazers are meeting for the 5th time this season. The Rockets are 2-1-0-1 in the first four games, having out-scored the Blazers 17-12, including 13-5 in two home games. After tonight’s game the Blazers again return to Prospera Place January 5th before the Rockets are in Kamloops January 15th. The Rockets enter tonight’s game with points in six of seven games (4-1-0-2), and have won three straight overall after wins over Brandon, Prince Albert and Saskatoon prior to Christmas. The Rockets are coming off a 3-2 overtime win in Saskatoon December 15th. Jamie Benn scored the game winner with .8 seconds left in the extra session for the team’s 20th win of the season. Tonight the Rockets open a portion of their schedule playing 5 of their next 7 games on home ice. The Rockets host the Blazers tonight before traveling to Vancouver on Saturday. The Rockets close out the long weekend with a stop New Year’s Eve in Chilliwack to face the Bruins. Nerves of Steel: The Rockets have played in a league high 23-one goal games this season. The Rockets have played in a one goal game in 7 straight. The Rockets are 4-1-0-2 in those games. Final 35: With just 35 games left in the regular season, the Rockets play 20 home games and 15 on opposition ice. Of the Rockets next 12 games, all twelve are against BC division rivals including four games against Prince George and three against Chilliwack and Kamloops and two against Vancouver. Colin Long: Long has points in 11 of his last 12 games (9+13=22). Long has multiple point games in six of his last 9 games. Long has 13 goals in his last 18 games. Cody Almond: Snapped a 16 game goal scoring drought with a power play marker in Saskatoon December 15th. Jamie Benn: goals in five of his last 6 games. Brady Leavold: 4+4=8 in last 8 games. Lucas Bloodoff: No goal last 11. • Kristofer Westblom and Torrie Jung have shared the goaltending duties through the last 7 games. The last time either goaltender played in back-to-back contests was when Westblom started in a 3-1 loss to Chilliwack December 2nd before earning a 4-3 overtime win against Medicine Hat December 5th. • No team in the Western Conference has played more games than the Rockets 37. Chilliwack, Prince George and Everett are next in line with 36 games played. Red Deer and Regina have played the most games with 38. • The Rockets have scored the second most goals in the Western Conference (125). Only the Tri City Americans have scored more goals. The Rockets have also suffered 4 shoot-out losses this season. Only Swift Current has suffered more setbacks in the shootout with 5. Broadcasters Bits: The Rockets have been held to a goal or less in 7 games this season….Last season the Rockets were shutout 13 times. This season they’ve been shutout just once, by Vancouver in a 5-0 setback September 29th…The Rockets have points in twelve of their last 15 road games (8-3-1-3)…The Rockets have given up a power play goal in 25 of the 37 games they’ve played this season…The Rockets have been involved in a one goal game in 11 of their first 16 home games. The Rockets are 5-4-1-1 in those one goal contests…The Rockets have been involved in twenty–three one goal games this season…The Rockets are 8 and 11 in the shootout since it was adopted…The Rockets have just one loss in their last 7 home games (6-1-0-0). That one loss came at the hands of the Prince George Cougars in a 4-3 setback November 24th. I thought I would share my opinion and give the Rockets players a grade at the half way point of the season. The Rockets hit the 36 game mark against Prince Albert Friday night. If you disagree with the grade, tell me why, and share your thoughts below. This is just one broadcasters opinion. 'Twas the final days before Christmas and the Rockets were out East, completing a 6 game road trip, which would provide famine or feast. Yet after 22 wins just last year, the Rockets now have 20, providing an abundance of Christmas cheer. With Colin Long leading the charge, and Jamie Benn banging them home, the Rockets are scoring goals on the road, and at home. Brady Leavold provided grit, determination and skill, the Bloodoff boys - Evan and Lucas - shot the puck at will. Captain McEwan showed leadership and fought all the battles, rookie defenseman Collin Bowman was green, but simply couldn’t be rattled. A young kid named Tyson Barrie came to play, while the Rockets got a defensive effort from Myles MacRae. A sophomore named McMillan didn’t bow to the pressure, while Cody Almond anchored the second line, but was none the lesser. Kristofer Westblom and Torrie Jung kept opposition shooters at bay, veteran d-man Tysen Dowzak proved to Rocket fans that the dude can in fact play. Coach Huska took charge, meaning Jeff Truitt wasn’t needed any longer, NHL scouts looked at Tyler Myers and said, could that be Chris Pronger? Luke Schenn wore the maple leaf and made us proud, they were scoring so many goals the fans were saying isn’t that horn at home games nice and loud! The Rockets received a solid effort from Milan Kytnar, while Arizona product Kyle Verdino exclaimed, I hate this long Canadian winter. Jesse Paradis, Colin Joe and Kyle St. Denis were having so much fun playing with Matt Brusicano, that secretly Dylan Hood confessed that he indeed plays the piano. Riley McIntosh was seen jumped up and down with glee, the Rockets success was better than winning a provincial championship in pee-wee. 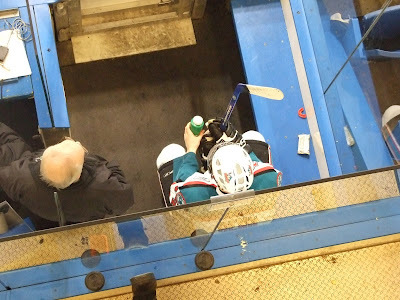 So as we head into Christmas let’s be thankful and say, I enjoyed the first half the season the Kelowna Rockets way. Prior to Saturday's game between the Blades and the Rockets, look who I ran into? Former Rockets Paul Hurd (left) and Bart Rushmer (right). Hurd played just one season for the Rockets in 2000-2001 while Rushmer played two seasons in K-Town, from 2000 until 2002. Both former alumni are now in Saskatoon at the University of Saskatchewan. I love to catch up with former players, and having a chance to see these two was a great way to conclude the trip. The Blades have retired five players numbers over a history that began in 1966. 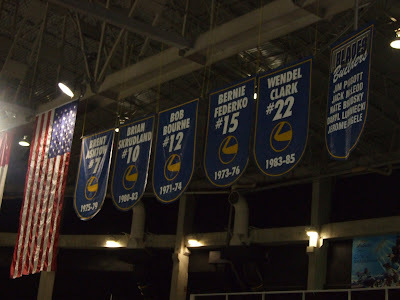 One of those numbers retired was #22 worn by Wendel Clark. Clark played two seasons with the Blades from 1983-85, before becoming a 1st round pick of the Maple Leafs in the 1985 draft. Clark played his entire junior career as a defenseman before being converted to a forward at the NHL level. 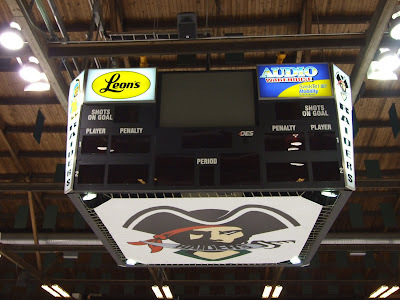 The score clock at the Credit Union Centre in Saskatoon. She's a beauty, and frankly is to huge for the building. It is so large, that it hangs over one of the blue lines instead of center ice because it simply can't fit between the beams. This is the hotel the Rockets stayed at in Saskatoon. 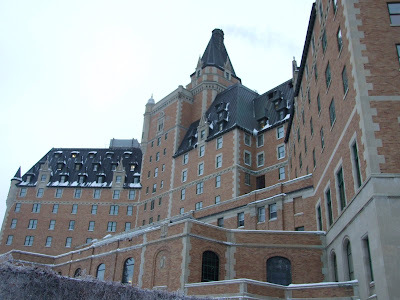 It's the Delta Bessborough. Rockets GM Bruce Hamilton likes to treat his team right, and staying at this lovely hotel is just another example of the class organization Hamilton wants to run. The beds, the food, the atmosphere in this hotel was second to none. It was a great stay. With one game left on the 6 game in 9 night road trip, this team should be proud of its accomplishments. The Rockets have played five games for a maximum of 10 points. With five-one goal games along the way, the Rockets have managed 6 points. In just one game, a 4-3 loss in Regina Sunday afternoon, the Rockets have managed a point in four of those five games. The trip ends tonight against Saskatoon, against a team that was handed a 6-0 thumping in Brandon Friday. Friday’s game in Prince Albert saw the Rockets control a good portion of the game. Had it not been for the solid goaltending of 17 year-old Steven Sanford, the game would have been out of reach for the home team. Sanford’s best save came on a spectacular sliding pad save, robbing Rockets forward Matt Brusciano of a sure goal. Rockets forward Brady Leavold was named the games first star, and spent the majority of the night on the Rockets number one line. It was interesting to see head coach Ryan Huska use Cody Almond with Jamie Benn and Colin Long on the first power play unit in the third period. Whether coach Huska was trying to jump start Almond, who is goalless in 16 straight games, may have been the reason behind the promotion? The Rockets lost Captain James McEwan early in the first period after he suffered a rib injury after sustaining a hard hit. McEwan was sent to hospital where tests showed no cracked or broken ribs. Those ribs will be too sore to play tonight against the Blades though. I anticipate Rockets rookie forward Kyle St. Denis returning to the lineup tonight against the Blades. 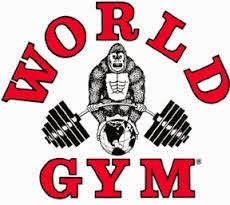 St. Denis was expected to play Friday, but sat out as he improves his conditioning. The Trail, BC resident has been out with a concussion. Rockets forward Myles MacRae was a healthy scratch for a second straight game. I don’t think I need to explain why that would be. No, the 19 year-old veteran isn’t hurt. Maybe his pride is? Justin Bernhardt wanted to play hard against his old team, but found himself serving 3 penalties, many for being over aggressive. It was great to see Bernhardt before the game, and if he is happy where he is, which he appears to be, I wish him all the best. Raiders Director of Marketing Bruce Vance was a superb host. The personable Vance is the mastermind behind the game night experience at Raider home games. 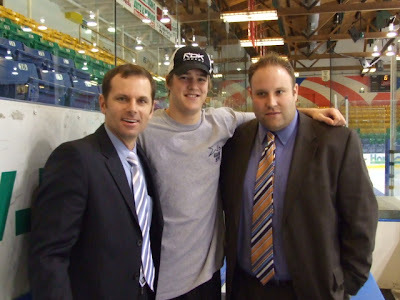 Vance applied his talents in Lethbridge, and brings that same type of passion and energy to the Raiders organization. The team is lucky to have him. I took a good tour of the Art Hauser Centre before the game, and was truly impressed. During my 2005 visit, work was in full swing on the new lobby, which is now complete. It was money well spent, as the Raiders have a home to be proud of. I will admit I am still not a fan of the broadcast booth, which needs an upgrade, but the improvements to the building are evident at every turn. Rockets team psychologist Dr. Murray Smith has been with the team over the last two days. Smith has met with several players during his time in Saskatoon, and is someone who the player can trust and confide in. Smith has been working with the Rockets for the last ten years. This is a picture of Jamie Benn in the penalty box below the broadcast booth. This just shows you how close to the ice surface we are when broadcasting games at the Art Hauser Centre. David and I spoke with former Rocket Justin Bernhardt before the game. Bernie is enjoying his time with the Raiders, and it's nice to see him having fun in his 19 year-old season. This is neat piece of art in the lobby of the Art Hauser Centre. The piece was designed by a Saskatchewan artist. 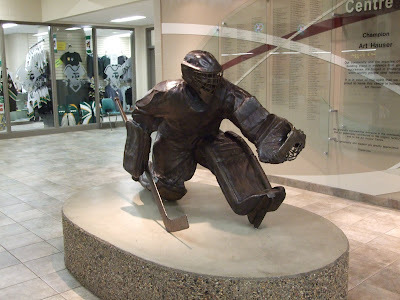 The goaltender making the glove hand save is situated in the lobby, known now as the Johnny Bower Lobby. The former NHL great was born in Prince Albert. This is the impressive score clock at Art Hauser Centre. It even comes with a video monitor for replaying goals. I like the added touch of the Raiders logo underneath the score clock. Tonight’s Preview: The Rockets and Raiders are meeting for the one and only time this season. The Rockets last visit to the Art Hauser Centre was October 14, 2005 in a 6-4 win. The Rockets are 5-3-0-0 in their last 8 games in Prince Albert dating back to the start of the 1996-97 season. The Rockets last shutout the Raiders at home on December 18, 1999 in a 1-0 win. Tonight’s game is the 5th of 6 straight on the road for the Rockets through the Eastern Conference. The Rockets are 1-1-0-2 in the first four games, with all four games being decided by just a single goal. The Rockets snapped a five game losing streak on the road Wednesday night with a 5-4 win over the Brandon Wheat Kings. Colin Long (2+3=5) and Jamie Benn (2+2=4) led the Rockets attack. The Rockets officially hit the half way point of the season tonight with 18 wins, and sit 4 points up on Chilliwack for second place in the BC division. The Rockets close out the road trip tomorrow night in Saskatoon. Following the Christmas break the Rockets play 5 of their next 7 games on home ice. Schenn-sational: Rockets defenseman Luke Schenn has been named to Team Canada’s roster for the World Junior Hockey Championships. Schenn is the first Rocket to be named to the team since Blake Comeau was named in 2006. Schenn is eligible for this summers NHL draft. Long and Short of It: Rockets forward Colin Long is 3rd in league scoring with 50 points. Long is tied with Spokane’s Mitch Wahl for the league lead in assists with 32. Long has scored 22 more points than he did all of last season. Long was a -29 last season. This season the 18 year-old is +18, or a difference of +47 from a year ago. Long’s 50 points surpasses Cody Almond’s team leading 48 points from last season. Big Benn Rings Again: Rockets rookie forward Jamie Benn has scored goals in 4 straight games, and has 5 goals in his last four games. Benn has 31 points in 31 games, just one fewer then WHL rookie scoring leader Brayden Schenn. Benn has played one fewer game than Schenn. Barrie Ain’t Bad: Rockets rookie defenseman Tyson Barrie is on pace to register 50 points this season. Duncan Keith played just 37 games with the Rockets in 2002-2003, but racked up 46 points. Had he played in all 72 games, Keith was on pace to score 90 points as a defenseman. Rockets rearguard Tomas Slovak scored an amazing 18 goals and 53 points, which was good for 71 points in 2002-2003. Colin Long: Long has points in 9 of his last 10 games (8+11=19). Long has multiple point games in five of his last 7 games. Long has 12 goals in his last 16 games. Cody Almond: Fifteen games no goal. Last goal was Nov 7th vs. Rebels. No points last 7 games. Jamie Benn: goals in four straight games. Brady Leavold: 2+4=6 in last 6 games. Lucas Bloodoff: No goal last 9. • Rockets Captain James McEwan is closing in on 200 games played. McEwan plays in game #198 tonight. McEwan led the WHL in fighting majors last season with 26. This year McEwan has 8 fighting majors, including four in his last 7 games. • The Rockets have just two Saskatchewan born players on their roster. Overage goaltender Kristofer Westblom is from Meadow Lake Saskatchewan while defenseman Luke Schenn is from Saskatoon Saskatchewan. • The Rockets have scored the second most goals in the Western Conference (119). Only Spokane has scored more goals (121). Brandon leads the league with 124 goals scored. The Rockets are 37 goals shy of matching their goal total from all of last season. • The Rockets have 18 wins this season, just four shy of the 22 they recorded all of last season. The Rockets have 9 road wins, 3 more than all of last season. The Rockets have scored 59 goals on the road this season, just 6 shy of the 65 they scored all of last season on opposition ice. • The Kelowna Rockets franchise is closing in on 600 wins as a franchise. The Rockets have 595 wins heading into tonight’s game. The Rockets are in their 17th season of operation, after breaking into the league as an expansion franchise in 1991 as the Tacoma Rockets. Road Trip Success: The Rockets last visit to the prairies for an extended road trip was in October of 2005 when the team went 5-0-0-0. It’s not the first time the Rockets have had that type of success though. The Rockets were also 5-0-0-0 back in December of 2003 and again were 5-0-0-0 in December of 2000 through the prairies. The most unsuccessful trip was in December of 2001 when the team went 0-4-1-0, losing three of those games by a single goal. The only point on the trip was a 5-4 overtime loss in Brandon. Broadcasters Bits: The Rockets have been held to a goal or less in 7 games this season….Last season the Rockets were shutout 13 times. This season they’ve been shutout just once, by Vancouver in a 5-0 setback September 29th…The Rockets have points in ten of their last 13 road games (6-3-1-3)…The Rockets have given up a power play goal in 24 of the 35 games they’ve played this season…The Rockets have been involved in a one goal game in 11 of their first 16 home games. The Rockets are 5-4-1-1 in those one goal contests…The Rockets have been involved in twenty – one goal games this season…The Rockets are 8 and 11 in the shootout since it was adopted…The Rockets have just one loss in their last 7 home games (6-1-0-0). That one loss came at the hands of the Prince George Cougars in a 4-3 setback November 24th. Overtime Winning Goal: Tyler Myers scored at 3:58 of overtime December 5/07 in a 4-3 win over Medicine Hat. Colin Long scored at :44 of overtime Nov 23/07 in a 7-6 win over Kootenay. Jamie Benn scored at 1:07 of overtime Nov 2/07 in a 3-2 win over Chilliwack. Rockets forward Colin Long finds himself 3rd in WHL scoring after his 5 point effort Wednesday night in a 5-4 win over the Brandon Wheat Kings. Long’s two goals and three assist effort gives him 50 points on the season. What makes Long’s totals so impressive is last years team leader in points, Cody Almond , had 43 points in 68 games played. Long has exceeded that total after just 35 games. Long is having fun playing the game, and it shows with his effort, confidence and willingness to make an impact offensively. Long had a great night offensively, but his two way play late in the game shows why he is so valuable. Long spent the final minute of the game trapping the Wheat Kings in their own zone by winning puck battles, before setting up line mate Brady Leavold at the side of the net with what appeared to be a sure goal. Unfortunately Leavold shot the puck wide. Long’s hard work hemmed the Wheat Kings in their own zone as they attempted to break up the ice looking for the equalizing goal. While the Rockets have gotten behind in games this season, this year’s team has the ability to dig themselves out of a hole. A 2-0 deficit is not out of reach for this highly skilled team, who would have folded had they faced the same obstacle just a year ago. It was my first look at Wheat Kings forward Brayden Schenn, and the young fella didn’t disappoint. Schenn deserves all the praise he receives, and is the early favorite to be the Eastern Conference rookie of the year. I’m glad Schenn elected to play in Brandon this season because he provides the league with another skilled forward that hockey fans can enjoy. Schenn is another in a series of young and up-in-coming stars that makes the WHL such a great developmental league for future NHL players. David and I interviewed Brayden Schenn before the game and he has so many of the same mannerisms as his older brother Luke. We chuckled when we introduced ourselves to Brayden. He said to David and I “I know you guys, I listen to you guys a lot.” If Brayden turns into the quality individual his brother is, how can you not cheer for this kid down the road? My first impression of Brayden is he is already following in his big brothers footsteps. The Wheat Kings are a fun team to watch. Obviously the goaltender had a rough night Wednesday, but the Wheat Kings play an up tempo style that have them atop the Eastern Conference standings. I tip my hat to Head Coach Kelly McCrimmon for the series of banners hanging from the Westman Place rafters. The guy builds winners, and again the Wheat Kings will challenge for another division pennant. Hat’s off to the goal judge at the North end of Westman Place for being honest when Rockets forward Colin Long scored what stood up as the game winning goal in the third period. Long shot the puck with so much force, it went in and out in the blink of an eye. Both referees’ didn’t signal a goal, yet the red light did go on. After the play was eventually whistled down, the referee’s met with the goal judge before Long was awarded the goal. While goal judges across the league should be impartial, they are volunteers who love the game of hockey and the home team that they work for. To side with the home team would appear to be an automatic, so I give props to the goal judge for calling it the way he saw it. 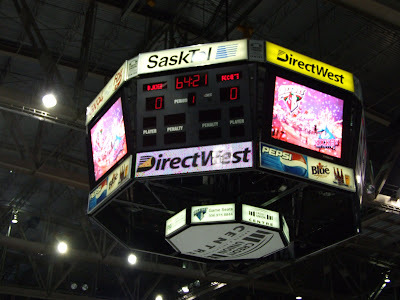 Westman Place has two interesting features. The benches are directly across from one another, not adjacent to one another, which is common place in most arenas in the WHL. The only other building I can think of that has a similar setup is the Medicine Hat Arena. The other interesting aspect of Westman Place is the coaching staff of both team’s must walk through the crowd to get to and from the bench. I don’t anticipate the visiting coaches getting into a confrontation with fans, but the possibility exists. That said the Wheat Kings have security nearby if such an altercation developed. The Rockets stopped in the Saskatchewan community of Whitewood for the pre-game meal. Arguably it was the best meal of the trip so far. Rockets defenseman Tyler Myers was in heaven, and couldn’t get enough of the place. Talk about a tight squeeze. 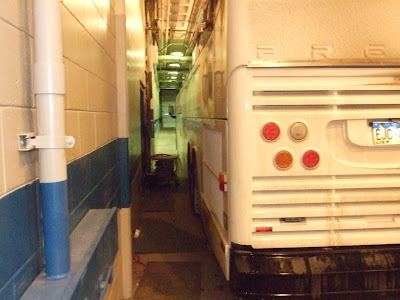 The Rockets bus backs into Westman Place to unload the gear prior to game time. While the bus is out of the cold and snow, a skilled bus driver is needed to negotiate down the narrow runway. Getting the gear out from the storage bins is never easy, as the doors on the bus want to slam against the side of the concrete wall. The players are cautious though, under the watchful eye of Roger Von Dach. Let me go on record as stating the smell of cattle was no where to be found when I hopped off the bus. 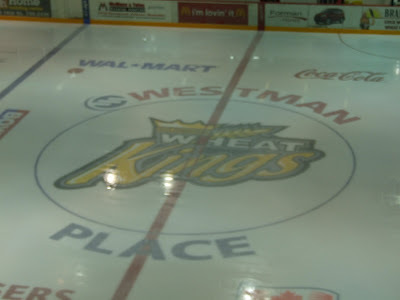 This is a picture of the ice surface at Westman Place. The Wheat Kings logo? You have to love it! Here is a picture of my favorite sports writer. Doyle Pontenteau of the Daily Courier makes the trek with the team when they make their Eastern Conference road swing. Pontenteau is a good friend, a good writer, and a darn good dresser. The Wheat Kings wore their retro jersey in last night's game. The jersey is the same color scheme and logo that the Wheat Kings wore in the 80's. The jersey's are a favorite of the local fans from what I understand, yet color analyst David Michaud had a different take when the Wheat Kings came on the ice for warm up. Unfortunately I have had some problems with my computer at the hotel in Saskatoon, so have been unable to post a game report from Brandon. I will post my thoughts and share some pictures with you once I solve the problem. Tuesday night the Rockets made a stop at the Moose Jaw Civic Centre where they lost 3-2 in a shootout. While the 'Crushed Can' needs a major renovation, the new visitors dressing room is nothing short of excellent. This new dressing room is a far cry from what visiting teams in past years were accustomed too. 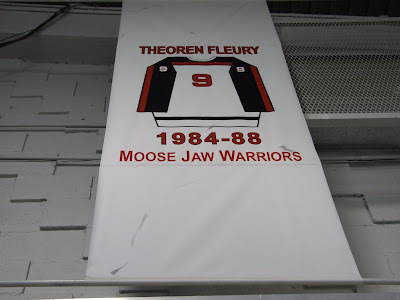 This is one of three banners hanging at the Moose Jaw Civic Centre of players jersey's that have been retired. The others are Mike Keane and Kelly Buchberger. 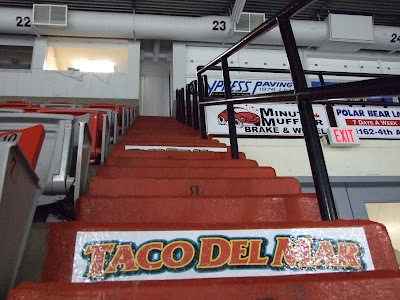 This is the Taco Del Mar Stairs of Death at the Moose Jaw Civic Centre. In all seriousness, these are the stairs leading to the broadcast booth. One miss-step, and you are tumbling to the bottom below. Climbing the stairs to the broadcast booth is a cardio workout. The Warriors organization hasn't exactly had an abundance off success since it was relocated from Winnipeg to Moose Jaw in the mid 80's. That said, the Warriors proudly display the teams Eastern Conference Championship banner. In the WHL final that season they lost to the Vancouver Giants in four straight games. It was a great day, and hockey had nothing to do with it. 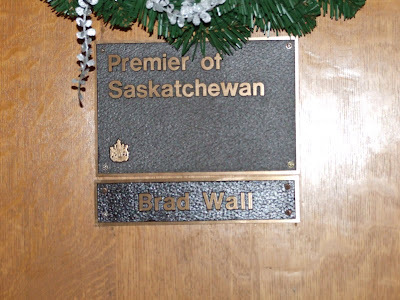 I had a chance to see Saskatchewan Premier Brad Wall at the Legislature. Wall and I go back to our days in Swift Current. Brad even introduced me in the Legislature during the opening of question period. 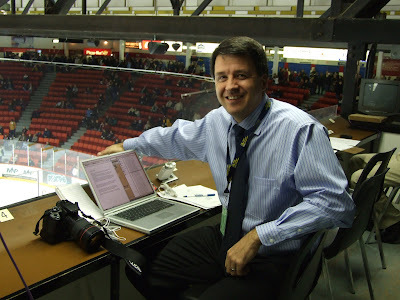 He did state that while we are friends from Swift Current, he also pointed out that I am the broadcaster for the Kelowna Rockets. I was honored. 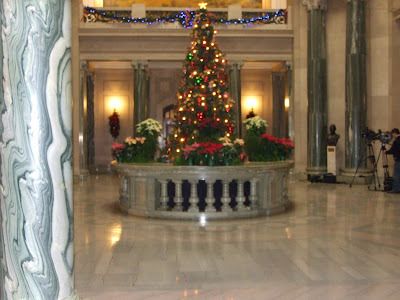 Inside the Legislature is a lovely Christmas tree. The Legislature was built in 1912, and is a spectacular building. 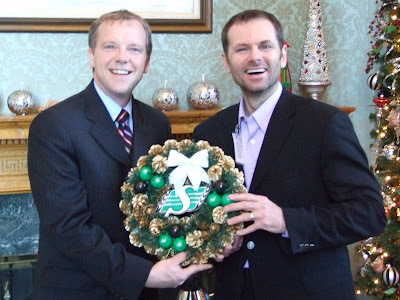 As for the Premier of Saskatchewan - class act! Tonight’s Preview: The Rockets and Warriors are meeting for the second time this season. These two teams clashed October 27th with the Warriors earning a 4-3 shootout win. The Rockets built up a 2-0 first period lead only to see the Warriors fight back and send the game into overtime and the shootout. Justin Maylan would score the game winner. 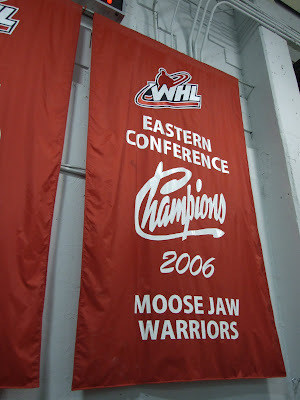 The Rockets last visit to Moose Jaw was October 12, 2005 in a 5-4 shootout win. The Rockets are 5-3-0-0 in their last 8 regular season appearances dating back to the start of the 1996-97 season. The Warriors have shutout the Rockets just once over that period, a 2-0 home ice win on October 12, 1999. Today’s game is the third of 6 straight on an Eastern Conference road trip prior to the Christmas break. The Rockets opened the road trip Friday night with a 3-2 shootout loss to the Lethbridge Hurricanes followed by a 4-3 loss in Regina Sunday afternoon. The Rockets are in Brandon tomorrow night before visiting Prince Albert on Friday. The Rockets conclude the road trip Saturday in Saskatoon. The Rockets are winless in four straight road games (0-3-0-1) after losses over Tri City (6-1), Chilliwack (3-1), a shootout loss to Lethbridge (3-2) and a (4-3) loss to the Regina Pats. The Rockets last road win was November 18th in Vancouver (5-3). Good Out of the Gates: In four of the last 7 road games, the Rockets have scored the first two goals of the game. The Rockets have had a 2-0 lead in back-to-back games against Lethbridge and Regina before eventually losing in a shootout or in regulation time. The Rockets have outscored the opposition 7-2 in the first period in those 7 road games before being out-scored 16-5 in the second frame. Rockets Rolling: The Rockets enter tonight’s game having recorded a point in 16 of their last 20 games (12-4-1-3). The Rockets enter tonight’s game having won 7 of their last 8 home games, with points in 9 of their last 10 at Prospera Place (6-1-1-1). The Rockets head into a portion of their schedule playing 5 of their next 7 games on the road. Jamie Benn: goals in back-to-back games Myles MacRae: Four goals in his last six games. Luke Schenn: 1+4=5 in last five games. Tyler Myers: 4 goals in last 8 games. Brady Leavold: 1+3=4 in last 4 games. Lucas Bloodoff: No goal last 7. • If the Rockets were playing in the Eastern Conference they would have scored the 3rd most goals in the conference behind Brandon and Swift Current. The Rockets have scored 112 goals this season or 3.4 goals per game. • Rockets Captain James McEwan is closing in on 200 games played. McEwan plays in game #196 tonight. McEwan led the WHL in fighting majors last season with 26. This year McEwan has 7 fighting majors. •Luke Schenn is trying to become the 7th Rockets player to play for Canada at the World Junior Hockey Championships. Schenn would join Robb Gordon, Jason McLean, Chuck Kobasew, Josh Gorges, Shea Weber and Blake Comeau on that list. Schenn leaves for Calgary to attend Team Canada’s main camp following tonight’s game. •Rockets rookie defenseman Tyson Barrie is 2 for 2 in shootout attempts. Barrie and Ty Wishart of the Prince George Cougars lead WHL defenseman in shootout success. Barrie scored 43 goals on the back end playing midget hockey last season. •Jamie Benn, an 18 year-old rookie, is 3rd in WHL rookie scoring with 26 points. Teammate Tyson Barrie is 7th in rookie scoring while Kyle St. Denis is 8th. Benn is tied with Brandon’s Brayden Schenn for the most goals scored by a rookie. Both players have 13 goals. • The Kelowna Rockets franchise is closing in on 600 wins as a franchise. The Rockets have 594 wins heading into tonight’s game. The Rockets are in their 17th season of operation, after breaking into the league as an expansion franchise in 1991 as the Tacoma Rockets. •The Rockets and Warriors have never been hot and heavy trading partners. In October 27, 1998 the Rockets traded 19 year-old defenseman Kris Mallette to the Warriors for then 18 year-old Justin Hansen. Broadcasters Bits: The Rockets have been held to a goal or less in 7 games this season….Last season the Rockets were shutout 13 times. This season they’ve been shutout just once, by Vancouver in a 5-0 setback September 29th…Rockets goaltender Kristofer Westblom has started in twelve of the team’s last nineteen games, posting a record of 9-4-1-1…The Rockets have points in eight of their last 11 road games (5-3-1-2)…The Rockets have given up a power play goal in 23 of the 33 games they’ve played this season…The Rockets have been involved in a one goal game in 11 of their first 16 home games. The Rockets are 5-4-1-1 in those one goal contests…The Rockets have been involved in eighteen – one goal games this season…The Rockets are 8 and 10 in the shootout since it was adopted…The Rockets have just one loss in their last 7 home games (6-1-0-0). That one loss came at the hands of the Prince George Cougars in a 4-3 setback November 24th. Is An Early Lead a Bad Thing? A Day Off On The Prairies! Rockets Making A Charge for First?